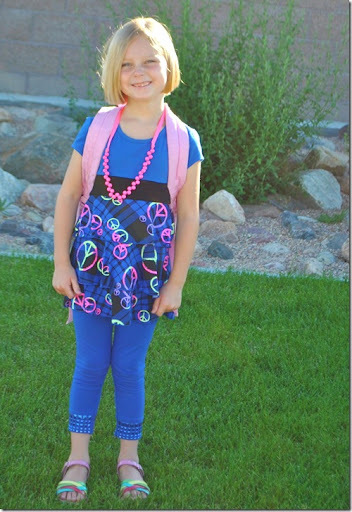 Halle started 1st grade on Aug 18th. She had been a little nervous all summer because someone told her that her teacher was bossy. She came home from meeting her teacher and dropping off school supplies and she was so excited. She said, “Mom—my teacher is sooooooooooo nice! She’s not bossy at all!” The relief was apparent in her face. While we were in Utah my mom took Halle on a special little “Halle and Grandma” shopping spree and got her some adorable new school clothes. Halle was so excited to wear her new, special clothes. And she looked adorable. Straight out of the 80’s but adorable none the less. We hope you have a fantastic school year miss Halle! August 25, 2010 in Uncategorized. She is adorable! I hope the school year goes great for you guys. And I laughed at your “she look's like the 80's” comment. I have said the same thing several times the past few weeks while school-shopping for Leah. I swear I had some of these same outfits 20 years ago! And wow, you have been busy. Happy Anniversary. The date sounded so perfect to me to. And Happy Birthday to Rusty. Sky-diving looked amazing! What a cutie! 1st grade is a big deal! How Fun! Shopping for school. You're right she looks like we did….Love it! Glad to hear she likes her teacher.